John “Turky” Turquoise III (Goss) is the titular Hollywood cop, and you better believe that a. He’s on the edge and b. he plays by his own rules. When Rebecca (Julie Schoenhofer), a woman from a rural area of California, finds out her son Stevie (Brandon Angle) has been kidnapped by gangsters because her former husband Joe Fresno has made off with six million dollars and the baddies want to exchange the kid for the loot, she comes to “the big city”, Hollywood, California, to right the situation. She quickly runs into Turky (why wouldn’t he be named “Turky”?) and he agrees to help her. Teaming up with his partner Jaguar (Kilpatrick), the duo not only have to face angry chief Bonano (Mitchell) and the questionable fellow cop Lt. Maxwell (Donahue), but they also must do battle with crime lord Feliciano (Mitchum) and his army of goons. Will Turky save the boy and woo his comely mother...all in time for Thanksgiving? Find out today! God bless Amir Shervan. We should all pause just one minute in our busy lives to honor this great man. He’s an unheralded cinematic genius that has enriched all our lives with awesome entertainment. Both this and Samurai Cop are must-see, one-of-a-kind films. There are many similarities plotwise between his two “Cop” movies...so many that it would be pointless to run them all down, but Samurai Cop (1989) is kind of a remake/re-imagining of Hollywood Cop, and we should all be glad Shervan took this route. If he felt this formula had some more juice, we applaud him for trying it again. We’re just happy he continued/was allowed to make more movies after Hollywood Cop. Shervan assembled a killer cast this time around to help execute his singular filmmaking vision. David Goss, who has a criminally small filmography, but also appeared in Armed Response (1986), plays the main hero we all want on our side. If only his Samurai Cop counterpart Matt Hannon would team up with Goss in a movie, we’d all be the better for it. Hopefully they’re not rivals. Fan favorite Cam Mitchell appears as the forever-disgruntled police Captain. He puts in an appropriately irritated performance. Remember, he has no patience for Turky’s rogue ways. Troy Donahue is on board as well and it’s nice to see him, and Aldo Ray has one scene as a man inexplicably named “Fong”. He doesn’t seem to be channeling Leo J. James Mitchum plays the gang boss role, and he does a good job, but the kid, Brandon Angle, who plays Stevie, practically steals the movie. He’s a talented child actor that sadly didn’t seem to pursue a career in acting after this. Maybe he figured he couldn’t possibly top Hollywood Cop. He reached the pinnacle of his profession as a tot. Special mention should also go to Lincoln Kilpatrick as Jaguar, a man with a long and distinguished career that goes back to the 50’s. When he wasn’t starring opposite Charlton Heston in The Omega Man (1971) and Soylent Green (1973), he was playing some of the best BYC’s on film in such classics as the Gary Busey Bulletproof (1988) and the Wings vehicle Deadly Force (1983). 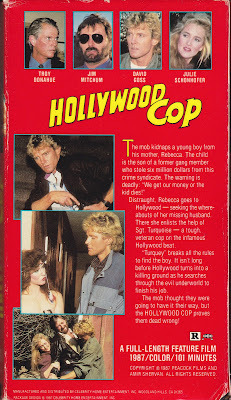 The plot of Hollywood Cop basically stops at one point so he can hot-oil wrestle with some bikini’d babes. His name should be more well known. It’s slightly more coherent than Samurai Cop, but Hollywood Cop truly has it all from an entertainment perspective: the B-list stars you know and love, a killer score (by Elton Ahi), tons of laugh-out-loud moments, sleaze, violence, and top-flight ridiculousness. It’s all pretty inexplicable. The main song, “Restless” by Andy Madadian, is a catchy winner that puts the icing on an already heavily-frosted cake. When you pop the Celebrity Video VHS in your VCR, there Goss the neighborhood. Don’t be a turkey and check out the awesomeness of Turky tonight! Gotta love the scene where 'Hollywood Cop' breaks it gently to the Arab guy about his wives' abductors with (QUOTE) "Listen mister, I know this guy just f**ked your wife, but he's our prisoner now"
That was great! There are so many hilariously fun moments in this movie. What a great cover! Never heard of this movie before, sounds like plenty of fun. It is a ton of fun! Would love your opinion on the all the wackiness in the movie! You also forgot to mention all the hilariously over-the-top sterotypes, there's jokes about blacks being on welfare, Asian's that can't pronounce Chevrolet correctly and Italian's with names like Spaghetti! Pure hilarity! my friend you present the most awesome actioners!One day i'm gonna make a list and start searching for all of them on ebay! VHS is the vilyn for the movie collector! Venom: Haha, there were so many ridiculous moments, we lost count! Uncle Spider: Thanks! We wppreciate the nice words. Sounds like a good idea. Definitely interested in what movies are on your list. A 4 star Ty review? From the guy that did Samurai Cop? Needless to say, I'm sold. It's on DVD too for a couple of bucks on eBay and Amazon! We are super excited for your opinion! This is another Amir Shervan classic. Imagine a cinema double bill of HOLLYWOOD COP and SHOTGUN? I skimmed your review because I'm looking to do this one myself in the near future, but I'm pretty stoked to check it out considering you gave it four stars! We are definitely looking forward to your take on it. If you loved Samurai Cop, you are sure to love this one too! Thanks for commenting Tony! That's awesome you were in this classic. What was it like being directed by Amir Shervan? That must have been crazy. Is this the only movie that Julie Schoenhofer was in. Did she die in a plane crash Northern California? Been meaning to revisit this gem. I will say however that unlike other films by Amir, you could (if you wanted to that is) actually take this seriously, cliche as it is, due to it having less language impediments unlike Samurai Cop. Anonymous: Hmm we're not sure about that. Jeff: Definitely worth the re-watch. There's so many crazy moments.